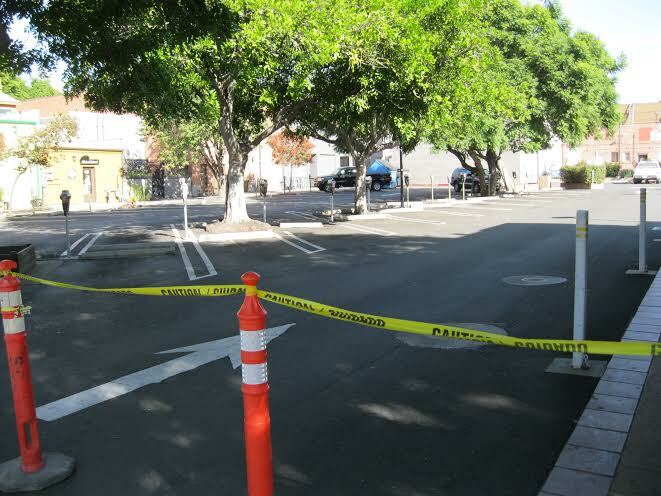 Monday, downtown shoppers hoping to park in the 60-plus public parking spaces in the San Luis Obispo City lot off Broad and Marsh streets, were greeted with signs telling them the lot is closed permanently, and yellow construction tape blocking entrances and exits. 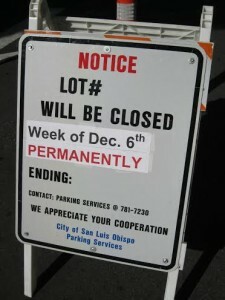 So, right at the beginning of the holiday shopping rush, the city erects yet another impediment to shopping downtown. The lot, which was bought and paid for by taxpayers for public use, has been transferred to a developer to erect one of the new tall tourist-serving view-blocking projects (Garden Street Terraces) taking over our beautiful downtown. Thus, parking passes from public use to private gain. Views are transferred from street level to the windows and balconies of high-paying hotel customers. In addition to parking, the transfer includes some very expensive public restrooms with some very expensive public art on them. All surrendered by the city council acting as fiduciary for the public. And they claim there’s no such thing as developer welfare in this town. This parking is the third major swath of downtown public-owned parking to be transferred to developers. The Copelands got the Court Street parking lots, and also the Chinatown parking lots, for pennies of what they were worth. Collectively, that means hundreds of parking spaces acquired by the public, with their tax dollars, for public use, have been transferred by the city council, acting as fiduciaries for the public, to developers for their private use — for far less than the fair value of the assets transferred. Taking away public parking during the Christmas shopping rush illustrates the myopia facilitating this entire enterprise of transferring public assets to developers. It has nothing to do with serving the public, which is supposedly why we have a city council. Downtown doesn’t look especially healthy these days. Lots of vacancies, and it’s unclear who’s going to occupy all the new space being built. Can there be still more restaurants and bars? How viable is retail in a downtown without convenient parking? How many boutique hotels are economically viable? The one boutique hotel we have is thriving, and adding a tall new building with more rooms. It is about to be joined by four more upscale downtown boutique hostelries collectively containing hundreds of pricey new tourist rooms. This seems an economic crap shoot. It’s happening so fast, moreover, the buildings will be built before anybody knows if they’ll be viable. One of the few bright spots downtown is the return of thrift shops. There used to be lots of thrift shops, real local stores, and “experimental” businesses downtown, before a handful of monopolistic property owners lined Higuera Street with corporate chain stores found in every suburban strip mall. Thrift shops are the paradigm of our time: cheap slightly used stuff for the masses made feasible by cast offs from those with too much stuff. They may reflect the inequality of our culture, but they also bring back a reason to go downtown again. As downtown transforms more and more into a partyland for the young and for tourists, there’s less and less reason for residents to bother going downtown. General retail seems doomed. With public parking being taken away, it’s easier to go to the mall or shop online. So thrift stores – the more the better – are good for downtown. As for the city’s timing for their latest parking lot closure, it’s just one more indicator how clueless the gals and guys who run this city have become. Merry Christmas residents – you can walk a half mile to shop from where you park. The city’s big Christmas gift is to WestPac, the Garden Street developer. Will they write a thank you note to all of us? Richard Schmidt is a former member of the San Luis Obispo Planning Commission. He recently wrote in CCN about views disappearing from downtown due to the city’s approving a slew of tall view-blocking buildings. The out of control council is steadily destroying the charm and unique character of our city. They are lackies of the developers who lust only for more power and money, at our expense. Damn shame those smug and arrogant fools haven’t been recalled. What else are they going to do the keep the city from going bankrupt and to keep funding the hugely underfunded pension system. They certainly don’t want to cut salaries, benefits, pensions or staff. They money has to come from somewhere. Maybe the truth is now really coming out. Is SLO the happiest place as advertised? It appears that idea may be changing as the city leaders are slowly ruining what use to be a nice place. I too, no longer go to SLO. With that many bars and the like concentrated in such a small area, how can it not be the happiest place? The answer is online shopping: NO parking, free shipping, minimal sales tax and no rude customer service. As a resident for over 30 years that used to drop a lot of coin in old downtown SLO shops, I seldom even drive through that cesspool let alone try and park and negotiate the crap businesses and plastic-faced women that flock down there. Have you noticed how it smells like whore-house once you make the turn on Higuera and pass Firestone Grill? It was good times when that was still a tire store. I will concede to your expertise on what a whore-house smells like! But, would otherwise agree with your statement. This city has been infected with greed. You will see terrible things come about because of this. Even if thousands of residents were to take to the streets and demand this building insanity stop…..it would do no good. Say goodbye to beautiful SLO….in just a few years you will not even recognize this place. Wait a minute, indigo1955, we’ve been strongly electing progressive public servants for decades… I’m confused. How is there greed and insanity? At least I am fairly certain it’s not a conservative *anything* in SLO (bureaucrats, elected officials, etc). What am I missing here? I thought pro-development greed and insanity were conservatives (or maybe even republicans)? That’s what the news always claims; what the teachers and professors often teach, etc. The lunatics are runny the asylum.